President Trump is eager to go head-to-head with the DNC which filed a multimillion-dollar lawsuit on Friday against several parties, including the Russian government, the Trump campaign and the WikiLeaks organization - alleging a "far-reaching conspiracy to disrupt the 2016 campaign and tilt the election to Donald Trump." Hours after the Washington Post broke the news of the lawsuit, Trump tweeted "Just heard the Campaign was sued by the Obstructionist Democrats. This can be good news in that we will now counter for the DNC server that they refused to give to the FBI," referring to the DNC email breach. 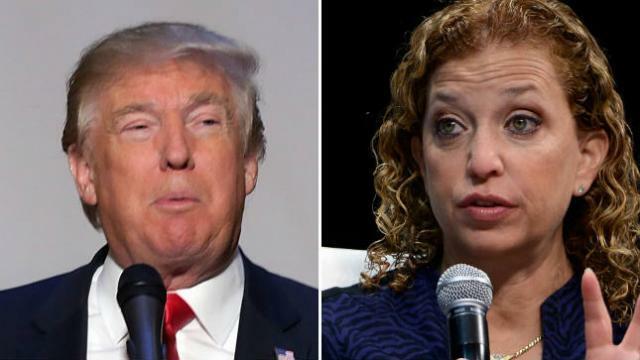 Trump also mentioned "the Debbie Wasserman Schultz Servers and Documents held by the Pakistani mystery man and Clinton Emails." The "Pakistani mystery man" is a clear reference to former DNC CHair Debbie Wasserman Schultz's longtime IT employee and personal friend, Imran Awan - whose father, claims a Daily Caller source, transferred a USB drive to the former head of a Pakistani intelligence agency - Rehman Malik. Malik denies the charge. Of note, the DNC would not allow the FBI to inspect their servers which were supposedly hacked by the Russians - instead relying on private security firm Crowdstrike. Meanwhile, the "Wasserman Schultz Servers" Trump mentions is likely in reference to the stolen House Democratic Caucus server - which Imran Awan had been funneling information onto when it disappeared shortly after the House Inspector General concluded that the server may have been "used for nefarious purposes." Imran Awan, his wife Hina Alvi and several other associates ran IT operations for at least 60 Congressional Democrats over the past decade, along with the House Democratic Caucus - giving them access to emails and computer data from around 800 lawmakers and staffers - including the highly classified materials reviewed by the House Intelligence Committee. The Awans notably worked for rep Andre Carson (D-IN) - the first Muslim on the House Intel Committee, who has several ties to the Muslim Brotherhood. 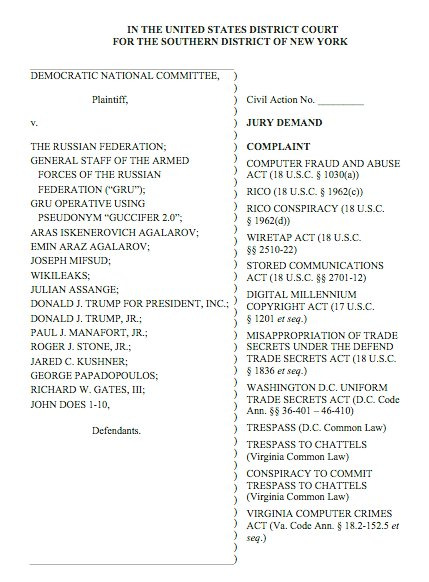 The DNC lawsuit, filed on Friday, asserts that the Russian hacking campaign - combined with Trump associates’ contacts with Russia and the campaign’s public cheerleading of the hacks - amounted to an illegal conspiracy to interfere in the election that caused serious damage to the Democratic Party.